I cook a lot. When you cook as much as I do you have to search for deals at the grocery store otherwise I would totally blow my food budget. I have a beautiful grocery store close to my house and I only shop there for their deals. I scour their weekly ads and zone in on all the by one get free offers, the buy 2 get three free offers and sale items. In the recent months I noticed that had a large shelf in the middle of the produce section. It's for reduced for quick sale produce. Now I don't usually buy stuff like this, but they must have a high standard of what they think is "ripe". I can buy a bag of 2-3 large eggplants or 6 zucchini for $1. They even put the organic fruits and veggies for a $1. The other day I noticed 4-5 bags (about 3lb each) full of organic roma tomatoes. I grabbed a few bags fast... organic tomatoes for 33cents a pound... unheard of! So now I have my stash of tomatoes that I need to use up. I created this Greek Bruschetta Pizza since I had bought feta cheese at on sale as well. I made these for my husband and I for lunch one day and he loved them. I can't wait to go and check out my discount rack at the grocery store again. 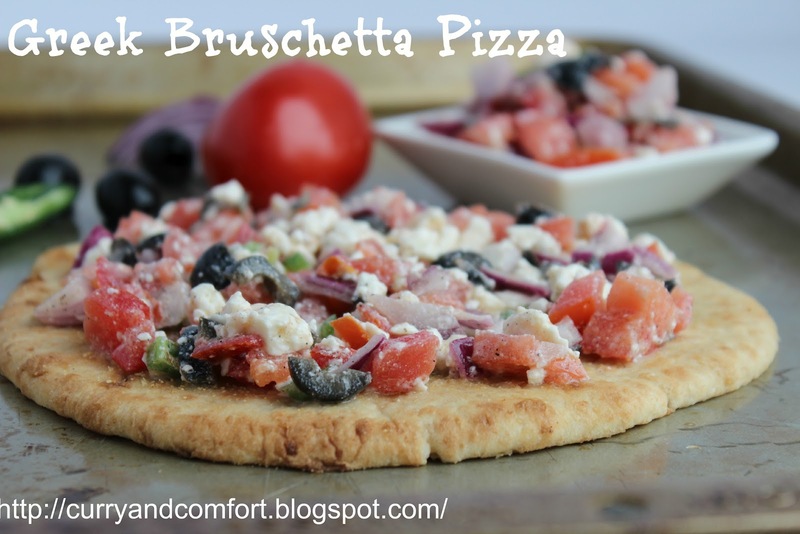 Prepare Bruschetta ingredients and season to taste. Next mix the butter and granulated garlic. Spread it on both sides of the naan bread and place on a griddle. Toast both sides of naan until crispy. Top with bruschetta toppings. Serve in slices. Enjoy. This is completely fabulous, Ramona! 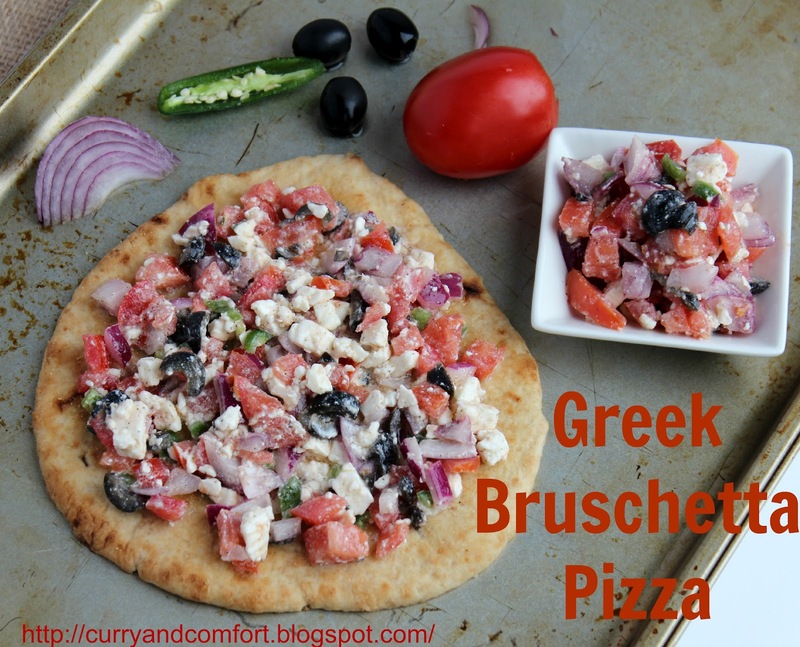 I love Greek flavors and put them on just about anything but haven't done pizza yet. This is my kind of dinner! Love it!! I totally get the blowing of the food budget if you are not careful. I experience the same thing. The greek style pizza looks delicious. Thanks for sharing. This looks fantastic!!! 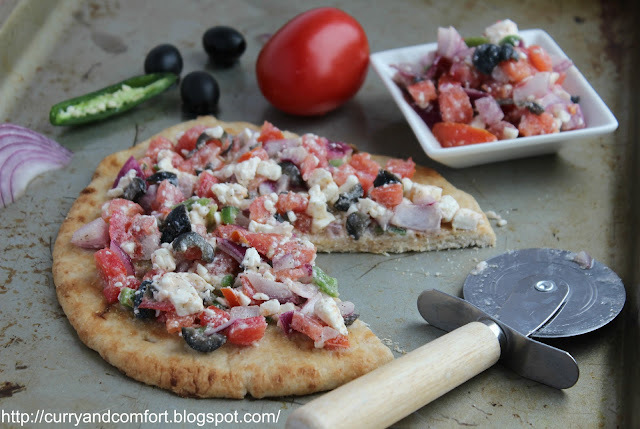 I love that you used Naan for the crust...and the Greek topping is just perfect! I wish I had a grocery store like that! I would buy all the produce up and can! I am jealous! The pizza looks amazing too! aww ...this is awesome and beautiful clicks! Okay seriously, this is gorgeous. You know me and pizza. I'm so bad about staying on a budget when I grocery shop! I love this pizza! It combines two of my favorite cuisines! Sorry didn't finish my message before I signed off! 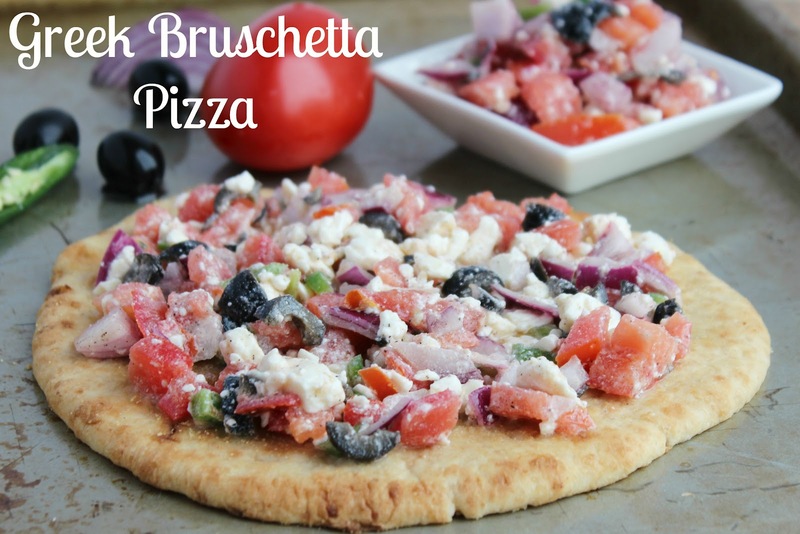 Oh, I am not a fan of black olives but I love everything else on this pizza. We would keep them on though cause my husband is a huge fan of all sorts of olives. Great twist on a classic! Your first sentence made me laugh - "I cook a lot." Really?!?!?! Now who would have guessed that. :) You're so funny! Bring on the tomato recipes! And you can give a pizza recipe like this anytime! love it! I am ready and waiting for those tomato recipes. If they're anything like this one we are in for a real treat. These Pizza making ideas are worth to watch. Thanks for sharing, keep up the good work. As I am engaging myself in pizza delivery services, I think it's also important to concentrate to design some thermal bags for pizza delivery. Hope you will share some ideas on that.